The third round of the 2019 FIA Formula One World Championship began with practice Friday at Shanghai International Circuit as teams prepared for the Chinese Grand Prix Sunday – the 1,000th grand prix in Formula One history. Two 90-minute sessions – FP1 and FP2 – on the 5.451-kilometer (3.387-mile), 16-turn track were run under dry conditions, with drivers navigating the track’s yin-yang characteristics. Both Grosjean and Magnussen began FP1 on the Pirelli P Zero Yellow medium tire before transitioning to the Red softs. Grosjean’s quick time of 1:35.507 came on his 15th lap shod on softs. He ran 24 laps and was the 10th-fastest driver. Magnussen’s best time was a 1:35.517 on his 18th lap, also set on softs. He ran 25 laps and posted the 11th-quickest time. Leading the way in FP1 was Scuderia Ferrari driver Sebastian Vettel, whose fast lap of 1:33.911 was .207 of a second better than the next quickest driver, Mercedes driver Lewis Hamilton. Speeds picked up and lap times dropped in FP2. Magnussen wrapped FP2 as the 16th-quickest driver with a time of 1:34.788, which was .729 of a second better than his best lap in FP1. His fastest time came on the 12th of his 34 laps on a set of soft tires. Grosjean finished FP2 with the 17th-quickest time of 1:35.704 on the 10th of his 32 laps in the session. His fast lap also came while utilizing the soft tire. Valtteri Bottas of Mercedes clocked the best lap of FP2 with a mark of 1:33.330, which was .027 of a second better than his nearest pursuer, Vettel. The Shanghai track record of 1:31.095, set last year by Vettel in the final round of knockout qualifying, remained intact. 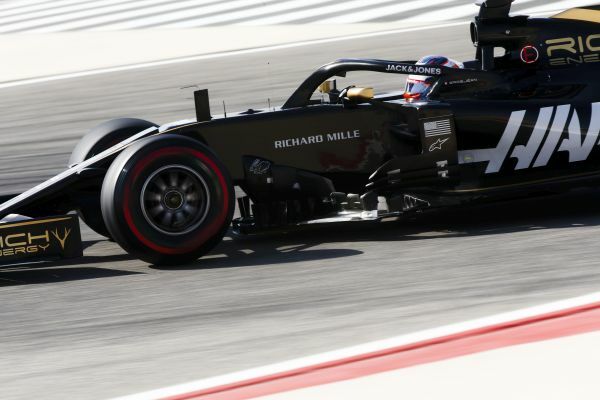 Between the two sessions, Rich Energy Haas F1 Team ran a total of 115 laps – 59 by Magnussen and 56 by Grosjean. Drivers have one more practice session on Saturday (11:00-12:00 local time) before qualifying starts at 14:00. Qualifying consists of three rounds, with the 15 fastest drivers from Q1 moving on to Q2. Then, the 10 fastest drivers from Q2 advance to Q3 where they’ll battle for the pole.